So, where’s the best place in NYC to buy oysters? You’re not alone in wondering; we get asked that question all the time! While there are a few notable markets that carry a variety of oysters, in general, oyster bars outnumber oyster markets by far in this city. So, we’re excited to announce a new Element Seafood Pop-up Stall at Gourmet Guild! 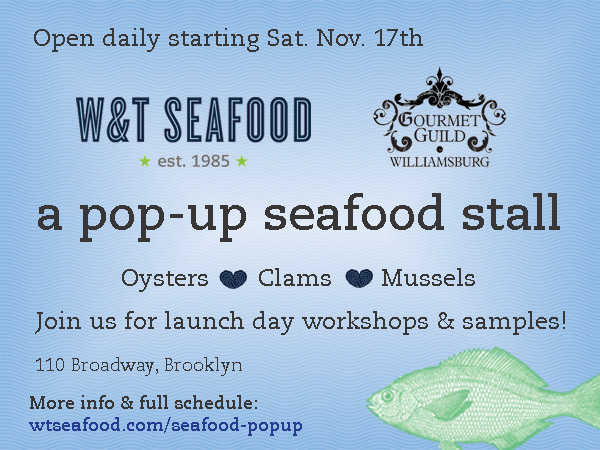 Starting Sat., November 17th, we will be manning a counter at Gourmet Guild, Williamsburg’s premier gourmet specialty food shop. Every day, we will offer a rotating selection of fresh East and West Coast oysters, clams and mussels, along with some oyster-centric merchandise like shucking knives, towels, display platters, t-shirts and more! As you can see, it should be a jam-packed afternoon. Stop by for some samples and bring your questions; we can’t wait to see you!